Launch: The ramp is across the slough from the Demopolis Yacht Basin. Leave your truck/trailer at the DYB for a small charge. Comments: Fred, the harbormaster, has been at the DYB for many years and is a pro. You will find a helpful, friendly staff. They can do mechanical repairs. Demopolis is one of our favorite towns on the Tenn-Tom Waterway. A short walk from the DYB, it has everything -- and all with a sincere smile. -----Charts. We like to have good charts of the waters we cruise. Like in life - we enjoy the illusion that the path we have chosen to tread is defined, clear, and charted. However, as in life, this is a fantasy. The charts are often out-of-date and some of the shoals, rocks, or stumps are not mapped. Always - always - the skipper has to be on the watch for the slightest clue on the water's surface that might indicate an obstruction below. 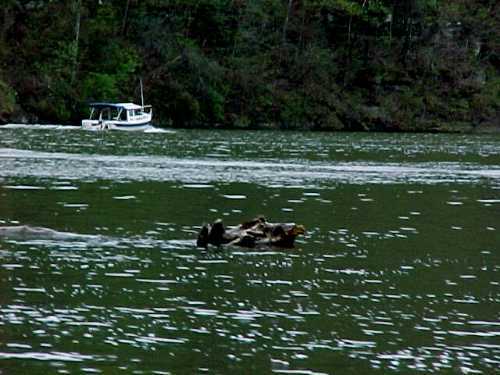 Struck, it might merely give a bump and make the heart beat faster- or, it could rip the bottom out of the boat. However, for all their falsity, we still cling to the illusion that our route is known - others have been here before us, and there are safe passages around the obstacles. -----We have a Chartplotter - a computer brain that displays charts on a screen just below our steering position. The small antenna picks up signals from satellites and triangulates them into a position displayed on the chart on the screen. Now the illusion sinks to delusion. If a paper chart seems real, one generated by a computer that marks our location on the chart within a few feet of reality, looks authoritative. Here is a virtual world that shows us moving across the screen. This must be certainty. -----Cruisers, new to the water and guidance electronics, display a sense of confidence that appalls those of us who have been on the rocks. Before long, they too have learned that a chart of water or life is, at best, a fancy. The course down the river or into the future has stumps and rocks - and joyous astonishment as well. -----There are no charts for the Black Warrior River. Oh, the Corps of Engineers has a fancy book showing the bridges, the course of the river, and the location of every navigation mark. They even have a book of aerial photographs of the river, complete with every river mile, bridge, and dam clearly marked. However, neither of these official government documents shows depths. When you are cruising a river, the depth of the water is the most crucial and fundamental element one needs for navigating. 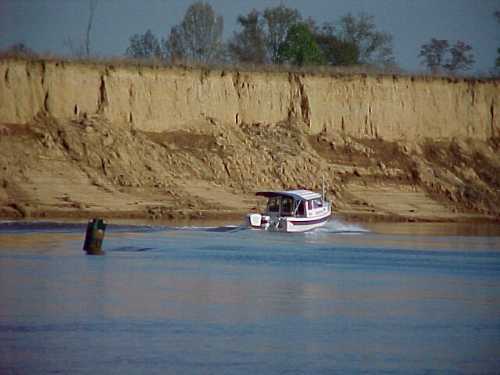 The river mile, location of a boat ramp or a barge loading facility may be of interest but the location of a sandbar, a shoal, reef, or rock is what keeps your hull intact and the boat floating. The government maps plot our future course and take care of our safety - but, like in real life, you don't ever want to trust your future to government. Life is a do it yourself job, and if you relied on the government chart you could easily end up on the rocks. -----There is one fishing map on the river - for the topmost lake. It depicts every fishing hot spot on the map with letters from A to VV, but regrettably also gives no indication of depth. So we cruise "depth" blind. We will know exactly where we are, how close is the best crappie fishing, and the route number of the highway bridge, but this is of little value hoved up on a rock. -----Sure, Halcyon has a depth sounder. This marvelous computer gizmo tells depths to the tenths of a foot, sonically samples the bottom to test if it is mud, sand, or rock, and finds every minnow with the temerity to swim under it's searching eye (it even says how big is the fish!). It tells us the water temperature, our speed over the bottom, and finds thermoclines in the water that might hide a fish or freeze the toes if we are swimming. Why it will even start screaming at us if the water depth falls below our preset fear depth. Therefore, why do we have any depth worries, with such a doohickey guarding our safety? -----There is one sad reality - the sounder is mounted in the stern and gives perfect hind sight. On our twenty-two-foot boat, that isn't too bad. However, traveling at twenty knots, we cover those twenty-two feet in a little less than one second. Build in reaction time, and I have about two heartbeats to jam the engines into reverse to avoid slamming the rock that lurks just under the (otherwise) deep water ahead. -----Now, cruising a river that carries commercial traffic isn't really so hard, since the deep water channel is well marked with red nuns and green cans. However, I still recall the tow skipper who, on a curve and in a fog, missed one mark on the Mobile River and unknowingly shoved his string of barges up a wide tributary creek and into a railroad bridge abutment just before the Amtrak train roared up the line toward the bridge. For many, it was a fatal mistake - and a tow captain is a professional. -----There are times we seek the shallows. We never anchor in or near the channel for a night's sleep. There's a patch of crushed fiberglass on the bottom of the Alabama Intercoastal Waterway that was once a fine sailboat. It was anchored beside the channel, sailing couple sleeping, when fog descended over them. The fog blinded the tow captain so he decided to shove his tows against the bank and wait for better visibility. It was a week before the Coast Guard found the remnants of the boat and her occupants. So, for our safe anchoring, we cautiously creep up into a bay or tributary stream seeking the shallows where a tow or barge would ground long before striking us. For this purpose, a chart showing depth would be helpful (some might say, necessary). However, cruising, like life, needs some risk to be flavorful. -----El and I were safely ensconced beneath the roof of the storage shed of the Demopolis Yacht Basin. Even rain couldn't easily find us, although two walls of the shed were open, so wind-blown dust swirls outside the windows on occasion. Demopolis, Alabama is a boater haven for those heading south on the Tenn-Tom Waterway to the Gulf. The marina is friendly and town a short walk away. 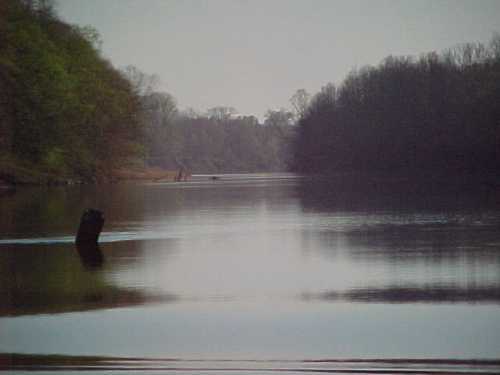 -----It is at the junction of the Tombigbee and Black Warrior Rivers. The 'Bigbee flows south to join the Mobile River and Mobile Bay and salt water - it is heavily traveled by cruisers seeking winter warmth or cool summers. The Warrior, upstream, leads to a dead-end at Sipsey. OK for hauling coal, wood chips, or fuel oil to the towns of Tuscaloosa or Birmingham, but seldom cruised by boats in transit. -----We had cruised the Tenn-Tom from Kentucky Lakes to Mobile Bay. Now, our sights were set on the unknown - the Black Warrior. We had appealed on the Internet for anyone who had information on the river - silence. Since it is a commercial river up to the Port of Birmingham, it has cruising depth and navigation marks - but no charts. The river was also in flood. Life has its challenges. -----We hunkered down, aboard Halcyon, under the tin roof of the shed at the marina and contemplated what little information we had. The Internet had supplied campground information, some data about the volume of commercial traffic, and a road map showing the river - not the information a cruising skipper finds the most vital, but far more than Columbus had at hand. Quimby's Cruising Guide is the Bible for the 9,301 miles of America's inland waterways. Proof of this statement is its thirty-eight revised editions. The Guide has a terse statement, "only in the Bankhead Pool are there marinas and other facilities for boaters." Whee-oo! That's more than 150 river miles above Demopolis. This is one wild river. 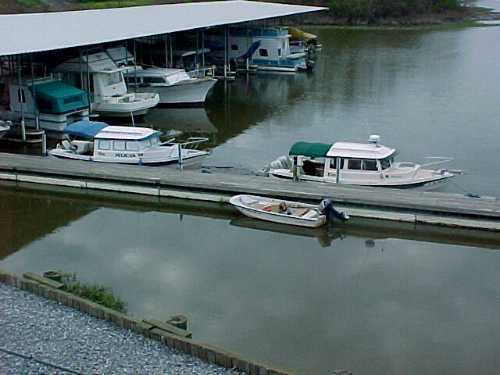 -----We could find no one at the Demopolis marina with much info. on the Warrior. The tow captains told us it is wild and beautiful - and full of hairpin turns. One curt skipper said, "You'all goin' meet yo'seves com'n 'round de bends." -----What is the source of inspiration? Some say divine intervention, others say a good night of sleep or a strong cuppa coffee - whatever the origin, the "Eureka" effect struck us. In the dark of night, under the shed roof, Boom! - we had the answer. El looked up from her book. "Come again?" -----"One-way," I shouted. "Yeah, that solves it!" -----"Are you OK, Bill?," El said frowning slightly. -----"El - Marge and Tom are coming down from Paduucah with their C-Dory Pelican." -----"We'll shuttle our vehicles from the top to the bottom of the Black Warrior and do the river one-way - downstream!" I was fairly jumping with excitement. -----"Gotcha," El said, sharing the enthusiasm. "We meet Marge and Tom at the top end, put in the boats, and you drive our rig to Demopolis accompanied by Tom in their van, leave our rig at the bottom, come back with Tom and off we go." 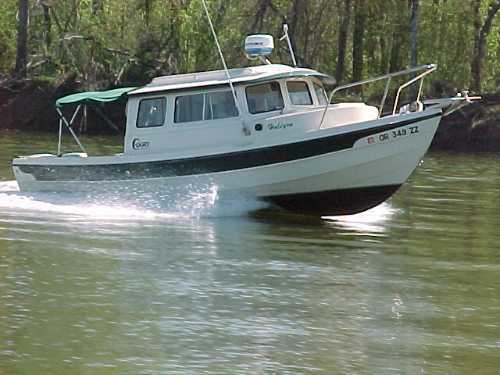 -----"Wow - then we're going downstream with any flloodwaters, saves fuel for the long stretch between marinas, and makes it all easy and possible." El summed it up and that's what we proposed to Marge and Tom, who readily agreed. -----A few days later, we put the data we had on lock and fuel stops into our Chartplotter and hitched up Halcyon. We provisioned and fueled up in Demopolis and headed north. We had talked with Bob Kirtley, at the Lighthouse Marina above the last lock on the upper Black Warrior. He had given directions to his place and assured us that water levels were fine up there and his ramp was in good order. -----They were, but we hadn't mentioned that his marina was way out there in the hustings and at the bottom of a steep hill with a hairpin curve. We left the freeway outside Tuscaloosa and followed a good two-lane, that soon started winding through wooded patches and steep hollows. Head frames, draglines, and furrowed strip-mined landscapes told the tale of coal-mining. The road shrunk and started winding. At each intersection, it lost a foot or so on each side. Soon, we were descending a narrow strip that twisted down to the river, the marina and the ramp. -----We had barely stopped (both the prayers and the vehicle) when a big smiling man came excitedly up the road to us - "A C-Dory," he shouted. "Never thought I'd see one here. My, she's as pretty as the picture." -----We could almost hear Halcyon purr as he ran his hand appreciatively along her flanks. "My, she's a beauty," he said with love-struck eyes. "Name's Bobby - Bobby Meeks. 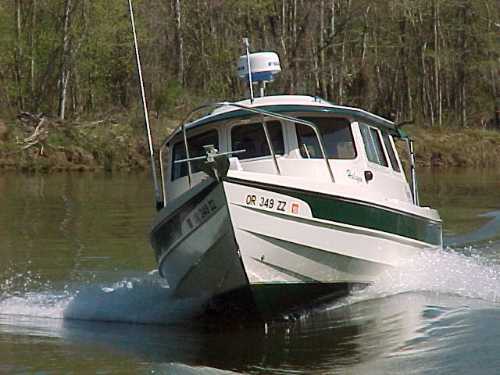 I've been sitting on my booat, reading River Horse, by William Least Heat Moon - you know, his tale about taking his C-Dory - on the water, most of the way - across the US - then I looked up and right there - on our lil' road to our marina - in the hills of northern Alabama - is a C-Dory! I just can't believe it." -----His pretty wife, Faye, soon joined with her camera. Bob was walking around, peeking inside, and generally looking over Halcyon the way the doc looks at us on our annual checkup. We were soon joined by the affable Bob and Glenda Kirtley, marina owners. We easily slid down their ramp and Halcyon was soon tied next to Big Honey, Bobby and Faye's beautifully-fitted houseboat. Pelican soon arrived and Tom and I completed the shuttle. -----That evening, sipping icy margaritas, we were all in the houseboat salon. Tom, Bobby and I were pouring over the Corps of Engineers aerial photos that Bobby had of the river and a fishing map of the uppermost lake. Bobby had cruised down to salt water and knew some anchorages - he was a big help and late into the night I was punching his data into our Chartplotter. 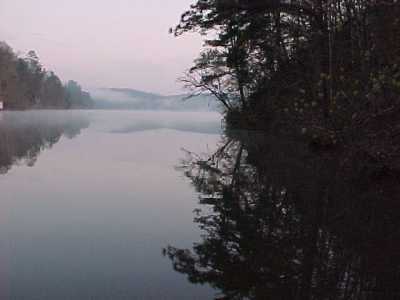 -----The next morning we pulled out of Gwin's Slough and into Bankhead Lake, the highest 'pool' of the Black Warrior. Within a hundred yards we cruised past a waterfall - what country! -----The Warrior slices through the Piedmont Plateau, the remnant of an ancient lofty mountain range. High tree-clad hills surround the lake. 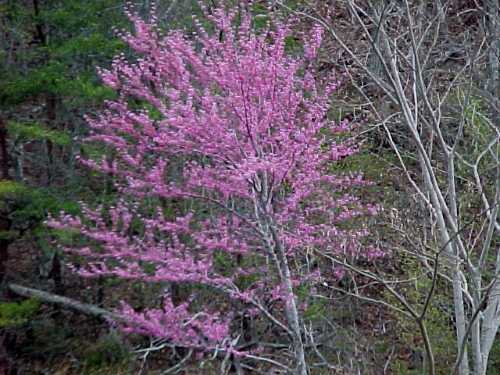 The redbuds were brilliantly announcing the arrival of spring. "Come back in a couple of weeks," Bob had promised. "The laurels will be a blaze of glory." -----We were curious about the river's name. "Why Black Warrior?" we asked Bob. "Named after Tuscaloosa," Bob answered. It turns out he loves local history and grew up knowing every inch of the Mulberry Fork of the river and all the hills around. "Tuscaloosa was a chief of the Creek Indians. He was a giant of a man, and with a dark complexion. The white folk called him the Black Warrior. He's long gone, but the name stuck to the river." -----Our GPS showed 18.1 straight nautical miles from the marina to the head of navigation, near Spice on the Mulberry Fork of the river. And the same device indicated it took 55.7 miles to get there by river. Sure is a serpentine flow. That tow skipper had it right! -----The farther north we went, the more constricted was the channel. Finally, we were there - the sounder was giving nervous "beeps" warning us of less than ten feet of depth. We turned when we saw tree stumps coming up from the river bottom. -----Downstream a few miles we slipped into Horse Creek and the hook held well to the muddy bottom. The familiar voice of our friend, Arnold a.k.a. Mushmouth, the computer voice of NOAA weather radio, was solemnly predicting a strong cold front to arrive in the night, "with possible heavy showers, damaging hail, and tornados." Now, for those of you not familiar with Arnold's ways, this is his standard prediction for every strong approaching cold front. However, we took his warning to heart and found an excellent sheltered cove, with steep hills covered with high trees to take the lightning strokes and block the winds. We did, however, ignore his admonitions to "please drive carefully and remember -always buckle up." -----The front arrived at first light with a few distant flashes and rumbles and no wind - let alone tornados. About nine the rainn stopped. The weather gradually cleared as we cruised down stream. -----Return trips always seem shorter than the going - and we were soon on the dock of the Lighthouse Marina. "Yellow Creek is a beauty. 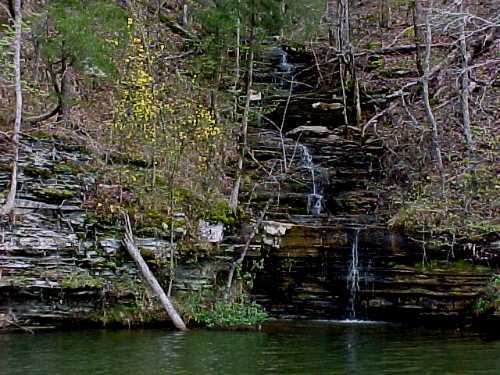 There are several waterfalls right near the entrance. 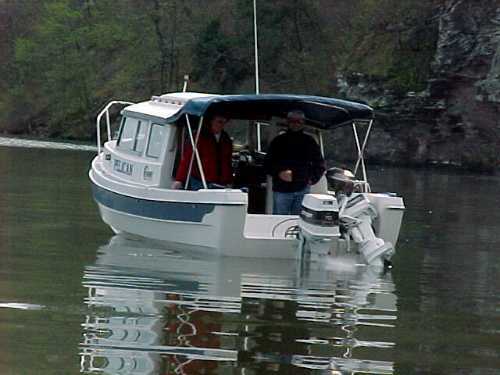 Water's deep, and you can go for miles," Bob advised as we were pulling out. "Don't miss it." -----We didn't. We were soon moseying up Yellow Creek and Bob is correct. It is a beauty. Wild, quiet, and deep. Hills rise abruptly from the waters edge and water tumbles down several of the runs. We turned at a sign that cautioned of shoals ahead, near a few summer cottages, and found a tributary to the tributary for a snug anchorage. We were soon visiting and having dinner. -----The next morning we pulled anchor to head down river to the first dam and attendant lock, around the corner from Yellow Creek. It is euphemistically called Lock 17, which is historically correct but somewhat confusing since there are but four locks on the Black Warrior System today. -----El radioed the lockmaster and she was greeted with a statement we've grown accustomed to from lockmasters. "Got a tow with eight barges coming up through right now. It'll be awhile." Meeting tows at locks fits into the same rule that you always find traffic jams on the morning of the big meeting with the boss. 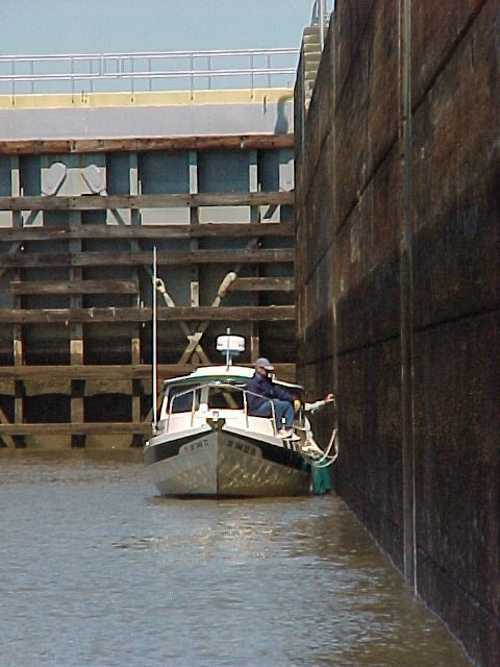 -----"You can slip up into Indian Creek just before the lock and be off the river while you hang around." We did, listening to the "peter, peter, peter" calls of the Titmice and the "whew whew whew" of the Towhees. Dawn in the springtime South is pure pleasure. The lock delay was a fortuitous opportunity to enjoy and it almost seemed an interruption when we were called to lock through. -----It's almost two hundred nautical miles on the river from the head of navigation to Demopolis, and it is almost sixty nm to the head of navigation from our put-in at Lighthouse Marina. Our tanks give us 170 nautical miles, with a bit added on since we had some current helping us downstream. The mathematics is unequivocal: Both Pelican and Halcyon would need refueling. -----We had been advised by Quimby's Guide that the last fuel stop is 132 miles above Demopolis, just above Holt lock. We spotted the marina and confidently found the fuel dock. After securing the boat, we climbed out to find the harbormaster. Closed! No one was at the marina except a lone repairman. "How do we contact the harbormaster," we asked the young man. "Beats me," he said with a shrug. 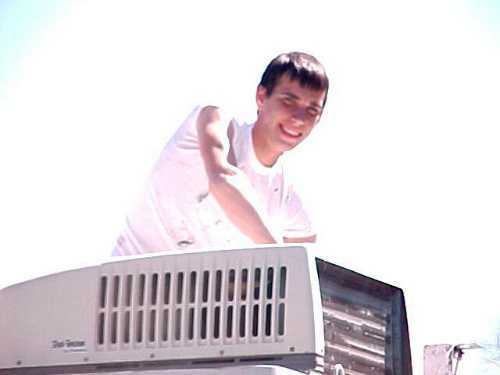 "Ah'm from Carolina and just doing some plumbing here." -----We checked our charts and noticed the Hide Away Marina a short distance downstream. We pulled in and quickly discovered they didn't sell fuel. We were stuck. -----Salvation arrives in an unsuspecting guise. A young, bright-eyed high school lad suggested, without a moment's hesitation, "I'll be glad to drive you up to a gas station. I have a bunch of gas cans in the bed of my pickup." And he did, refusing any cash to pay for his time. "Gotta help each other in life," he said with a pleasant smile. Anyone who says the younger generation is going to the dogs hasn't met Klint Sellers. -----We chatted with boat owners in the marina. "You really from Oregon?" one asked El. -----"We don't even see folks from Alabama, other than locals, on this river," ventured another. -----"Got any charts?" asked a third. We were soon given an Alabama Waterway Guide (unfortunately, also without any depths indicated) and Dwayne Curlee drove home to fetch us his Big Delta Waterway Guide, to the lower Mobile River. The natives are friendly in Alabama. Soon, with full tanks and new maps, we were on our way southward again. -----We locked through Holt lock. On a tight bend just below the lock, we met the towboat Alice Parker heading downstream. She's a chunky, powerful lady who was pushing some long, loaded barges ahead. She's all business but, we soon discovered, she has a big heart. -----"Yo'all come on by on the one whistle," Alice Parker advised as we snuggled close in the narrow channel. "Let me know when you clear my bow," she suggested - and we did. -----"Going to git cold tonight," Alice said as we moved ahead downstream. "Might freeze. 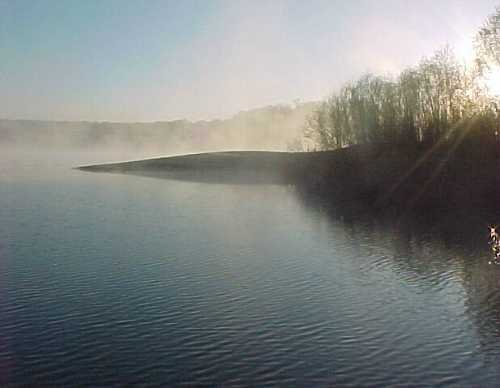 Temperatures drop thirty degrees on the river and we likely git fog," the big lady continued. "Where you all be spending the night?" -----"Don't know," El answered. "First time down the Warrior. Probably up a side channel." -----"Well," came the strong voice, "not many spots on this stretch. Maybe behind the west abutment of the second bridge down - you'd be outta trouble back in there. If'n that fog comes up I'll want to know where you're tied…"
-----There was a pause and we could hear paper rustling over the mike. "Gotta friend who lives right near there … thought you might tie to his dock, but can't find his 'phone number or I'd call. Well, let me know where you are." His last comment sounded much like our daughter - she "likes to know where we are." -----"Yes sir, we'll let you know what we do and thanks for the suggestion," El radioed back to Alice Parker. When we reached the bridge it didn't look very good to us - too noisy with the trucks overhead on the four lane. So we continued down the meandering river. 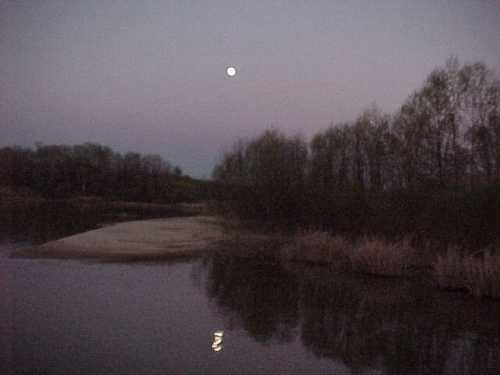 The sun sank lower and there were no sloughs to slip off the river. Marge, ahead on Pelican, radioed that she spotted one but trees blocked the entrance. -----"Halcyon. What mile you at?" We recognized the now-familiar voice of the Alice Parker, far astern by river miles but just over a few hills with the meanders of the river. El answered and again we heard the rustling of paper on the radio. "There's a tight turn at 299, just below you. Pull in next to the left bank descending, behind the two red marks, and there's a dandy spot right next to a small sand hill - it even has a sandy beach." -----We soon spotted the anchorage, pulled in, and dropped the hooks. It is a beautiful spot and we would never have noticed it. We radioed our thanks to the Alice Parker. "We'll be there later tonight and check on you," came the response. -----The moon rose, we finished dinner, and were reading quietly when El noticed the flash of the searchlight on the opposite bank. Soon the lights on the lead barges came slowly around the bend followed by Alice Parker. The spotlight lit up Pelican and then Halcyon, bright as day. The four of us were in the cockpit waving as the thoughtful big lady thundered slowly past us. "Sure want to thank you for the slow pass, Alice Parker," El radioed to the captain. "And your anchorage here is perfect." -----"Thought you'd like it there," he responded. -----"How long have you been working on tows?" El asked. -----"Thirty years," came back the strong voice. "Three weeks out and ten days home. Every time I git home it's like a honeymoon. Then after nine days we start spitting at each other, and out the door I go. I got a perfect wife and a perfect job." -----The next morning we awoke to a fog, just as Alice Parker suspected. We had a leisurely breakfast and lifted anchor. The Black Warrior is a wild river. Miles of shoreline are undisturbed and natural. Herons, ducks and kingfishers flew up at our approach. You meander through some of the most beautiful southern forest you can find anywhere. -----Late in the day we caught up with Alice Parker. "Had to bank the tow last night. Fog was too thick to run. Sho' glad we knew where you were when we shoved the barges against the bank." So were we. -----"How'd yo'all find this little ol' river?" asked our benefactor. "And, mo' remarkable, how'd you git hyah?" El chatted with him over the VHF. "Say," he continued, "jest below the next railroad bridge, there'll be a lil' ol' lady fishing on the dock - right bank. I'd 'preciate it if'n yo'd give her a slow pass. She's my Mom." We eased by the dock hoping to meet and chat with her but she must have been in town. 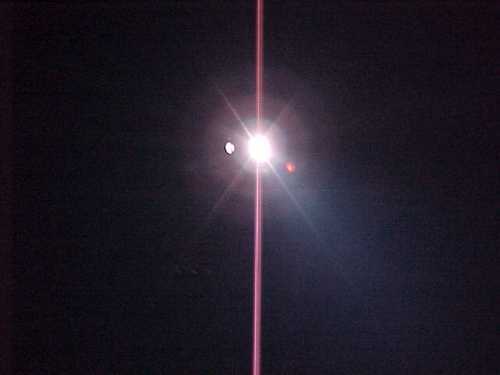 -----"Thanks for watching over us," radioed El to the Alice Parker, now, once again, far astern. -----"Yo'all have a safe trip, and come on back and see us, ma'am." An hour later, tied off in the Demopolis Yacht Harbor, we sadly watched the Alice Parker head on down Mobile way. We were going to miss sharing a river with the gracious big lady and her thoughtful captain.